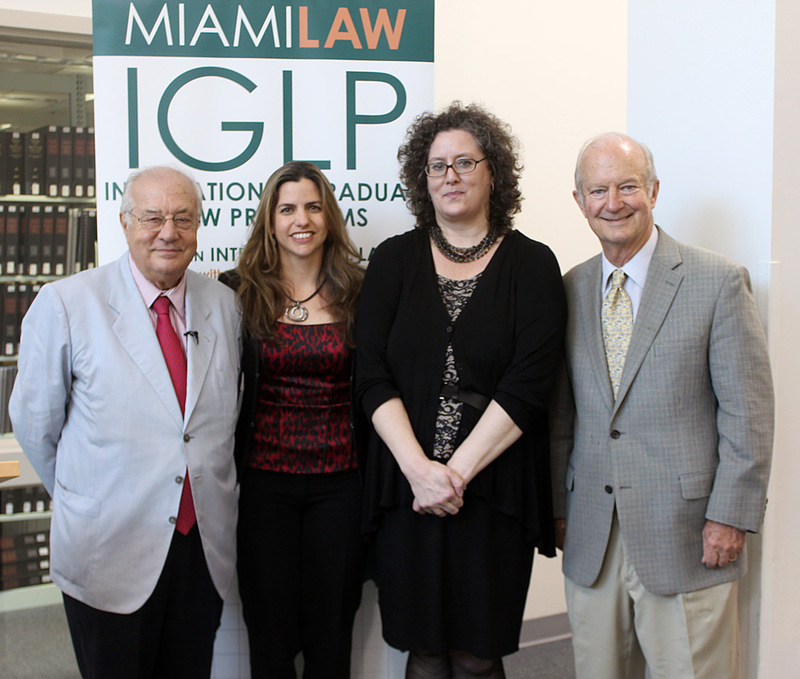 Dr. Ramón Mullerat, a lawyer and partner at Iuris Valls Abogados in Barcelona, was the spring semester's final speaker in the International Graduate Law Programs' lecture series at Miami Law, which was co-sponsored by the European Union Center of Excellence. His address, titled "Corporate Social Responsibility In Time of Economic Crisis: A European Approach," assessed issues in corporate self-regulation in Europe and the United States. Corporate social responsibility – referred to by its acronym CSR – is a form of self-regulation integrated into a business model. CSR policy functions as a built-in mechanism whereby a business monitors and ensures its active compliance with the spirit of the law, ethical standards, and international norms. In his address, Dr. Mullerat discussed the required reporting of CSR efforts in Europe and compared it to CSR policies in the United States, where it is voluntary. CSR varies from continent to continent, from country to country, from sector to sector and from corporation to corporation, Dr. Mullerat wrote in a paper on the subject. The European Union was the first continent to adopt the CSR movement. Although innumerable abuses took place in Europe's history, the region has traditionally had more consistent CSR values, norms and perceptions than in other areas of the world. European corporations have tended to hold stronger and broader approaches to stakeholder relations. Through CSR, corporations contribute to the EU's treaty objectives of sustainable development and a highly competitive social market economy. Dr. Mullerat highlighted two examples. He wrote that the United Kingdom is justly considered to be a leader in CSR, and is home to some of the world's leading thinkers, practitioners and campaigners in the field. The U.K., where the industrial revolution was born, is headquarters to a number of large accountancy firms; an environmental NGO community that engages with business; a history of privatization; and two powerful Anglo-Dutch corporations, Unilever and Shell, among other factors. French corporations, he wrote, are increasingly becoming active in CSR practices, although case studies show that the overall picture in France is one of moderate development of CSR because of a system of state regulations and labor agreements. There is, however, evidence of important initiatives going beyond legal requirements in many areas, Dr. Mullerat went on. The notion of CSR emerged in the U.S. as a reaction to the rapid growth of capitalism, which appeared in the 1870s. At the beginning of the 20th century, the appearance of large corporations and the era of the "robber barons" – businessmen who illegally amassed large fortunes – led to the development of the anti-trust movement and the corporate social contract doctrine. Corporations emphasized philanthropy and some forms of CSR in order to sustain the notion that government regulation was unnecessary. But as corporations grew, the U.S. government assumed responsibility for correcting the social behavior of big corporations as early as the 1890s, and it passed laws on child labor, safety at industrial sites and on workers' rights to form trusts. American corporations became more aware of their public responsibilities after the U.S. Supreme Court declared in 1906 that "the corporation is a creature of the state." "It is assumed incorporate for the benefit of the public," the ruling went on. "It receives special privileges and franchises and holds them subject to proper government supervision." The government passed legislation on labor protection, public utilities and banking services during the 19th and in the early 20th centuries. Trying to distance themselves from movement intervention, entrepreneurs such as Henry Ford and John D. Rockefeller put education at the center of the relationship between individual and corporate responsibility. A question-and-answer session, moderated by Professor Caroline Bradley, followed Dr. Mullerat's lecture. "We were thrilled to partner with the European Union Center of Excellence for our final lecture series of the semester," said Jessica Carvalho Morris, Director of International Graduate Law Programs. "Dr. Mullerat is renowned in this field and engaged the audience in a discussion on an issue of global importance. It was inspiring to have a talk that generated so much interest, not only among students, but also from our faculty." Dr. Mullerat is a member of the Bar Associations in Barcelona, Madrid, Paris and London, and an Honorary Member of the Law Society of England and Wales. Dr. Mullerat is a professor at the Faculty of Law of the Barcelona University and an adjunct professor at the John Marshall Law School in Chicago, and is a board member of Emory University in Atlanta. He was the former President of the Council of the Bars and Law Societies of the European Union and former Co-Chairman of the International Bar Association's Human Rights Institute. He holds membership in various American law organizations, including the American Law Institute, the Institute of North-American Studies, and the International Law Section of the American Bar Association. Dr. Mullerat's international activities include membership and leadership positions in the Council of Justice of Catalonia and the London Court of International Arbitration. Dr. Mullerat is the former Chairman of the Editorial Board of the European Lawyer and is on the Editorial Board of the Iberian Lawyer. For his contributions to the legal field, he has received prestigious awards from the Barcelona School of Law, the Barcelona Bar Association and Croatian Bar Association as well as from the Ministry of Justice in Spain.